Git on yer horse! Wait... you don't have a horse! Okay, we'll get you one... go all the way right when you enter the island. Talk to the guy next to the ranch. He's having some trouble with his horse, Elmer (not Elmo!) He says you can have the horse if you can tame him. This is pretty simple; just keep your mouse on the guide at the bottom until it's over, and you've gotten yourself a horse! Ride it to the left edge of town, and talk to the lady on the exhausted horse. She will tell you that she delivers mail for the Pony Express, but her horse is too exhausted to go anywhere. You have a horse! Volunteer to deliver the letter to Marshal Taylor. Go to the very right of the Saloon, and ask the guys there where Marshal Taylor is. They'll agree to help you if you beat them at a game of Spit-N-Time (competing to see how far you can spit some gum!) This is pretty simple; you don't even have to fill the power meter on the left! Use a 45 degree angle as a starting point, and make it higher the closer the spittoon is. Don't go below 45 degrees. Release the mouse just as the guide is moving over the bucket, and you'll make it in every time! Then, after the guys have pointed you to him, go left and talk to Marshal Taylor. Obviously he's been drinking! You'll have to read him the letter. It says that McGready's Bank in Rock Ridge is going to be robbed by the notorious El Mustachio Grande! You have to do something! You'll become the new Marshal! You can wear the badge or keep it off, but I recommend wearing it so the characters will recognize you as the Marshal. You can't stop the big heist just yet... we'll have to find El Mustachio's hideout first! That's what this island is all about. 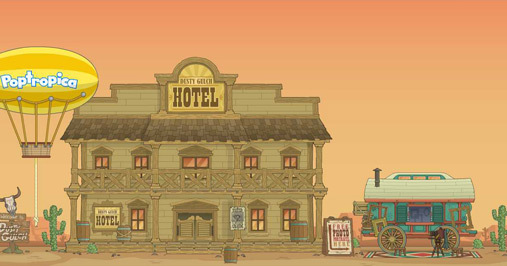 Leave the town for now, and ride back to Dusty Gulch. Go right until you see the photo wagon. The photographer who was disrespectful to you before now agrees to take your picture! This next mini-game is very easy; all you have to do is keep the mouse in one place and move it once in a while if it gets too wobbly. Once you have your picture, take it back to Diamond Plains and go into the Marshal's office. 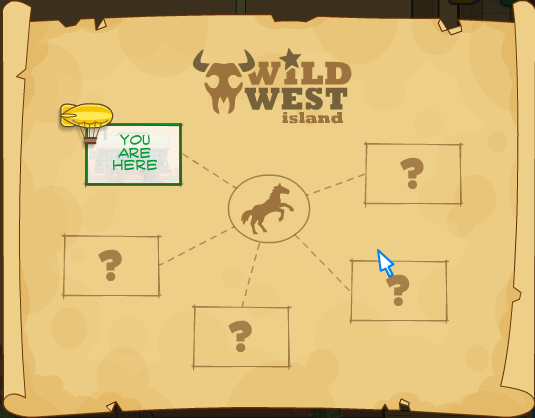 Now that you've gotten yourself a horse and become the Marshal, we can begin the fun part of Wild West Island! Travel to Dos Cactos (a little south of Dusty Gulch.) Dos Cactos is located on a high mesa that you can't jump onto, so you'll have to come in from the west side of it. You'll see the shooting range on the riding view. Once you're in, go right and talk to the guy near the very right side. He will let you compete against five different people in a shooting contest. You'll have to use your Pea Shooter in this fun mini-game. This is simple and very fun; just use your mouse to aim, and click to shoot. The higher a target is, the higher above it you should shoot. For very low targets, just shoot at it straight-on. This one time, speed is better than accuracy because your opponent will be racking up points fast! I don't think anyone's gonna lose on Round 3, where you're against the young kid! Once you're done with this, you will earn a Spud Shooter. Potatoes are much better than peas! Take this all the way right, where you'll have to deal with the edge of the mesa. You actually have to use the cacti to get yourself that high! It'll go a little quicker if you leave your horse. Once you're up there, go right until you see the Four Aces Casino. Walk in, and go up the stairs to the right. Go left and talk to the guy there (Gambler of the Month!) He will allow you to join him and some other people in a game of Slap-Jack. This is pretty fun, but it lasts longer than you may think. All you gotta do is flip a card onto the pile, and slap the card if it's a Jack. If you slap at the wrong time, you will have to give whoever's turn it was a card. If you time it correctly, you'll get all the cards on the pile! But beware of the fake-out... other players (usually ones who are desperate for cards) will pretend to put on a card but pull it back at the last second! You can't do this, but there's another tip I can give you to successful gambling: before putting a card on the pile, touch a corner of it to the pile. This will tell you what the card is and get you ready to slap the pile if it's a Jack. If you win, the "master gambler" will be forced to pay up. But he was so sure of himself that he didn't bring any money! He will give you a map to gold as a substitute. Don't go crazy just yet... we'll need a gold pan first to strike it rich! For now, exit the casino and follow the directions below. Get on your horse and travel to Rock Ridge. It's near the bottom right-hand corner. Make sure to enter from the west side! Jump up and talk to the lady there. She'll tell you a calf has run away from her ranch south of the town. Then she'll give you a lasso to catch her. Go outside and into riding mode, and follow the prints near the town (start riding west to find them.) They will start to fade out, then get refreshed by the stream again. After a while, you'll find the calf, standing near a tree! Chase her, and press the SPACEBAR to turn on your lasso. This next part is almost the same thing as the Round-em-Up game in the sneak preview for this island. If you don't know how to do this, basically just use SPACE to activate your lasso, and then SPACE again to release it. It will shoot out and grab the calf if you time it correctly. Once you have her, go to the very south and middle of the riding area. That's where the ranch is (you can kind on see it on your map.) Just carry her in, and she'll stay there. Then ride back to Rock Ridge to claim your prize. You will get an old saddle. Oh, come on, all that work for nothing but a beat-up saddle? Well, it'll prove to be very valuable in just a moment. You can collect the five cows she's talking about and return them to the ranch, but this part is optional. This time, though, you'll get something much more valuable: a Rattlesnake Wrangler outfit! If you do decide to go through with this, then keep in mind that most of the cows are in the bottom third of the area. So don't go wandering off too far! Travel again to Dusty Gulch and go into the Trade and Barter building, just left of the ranch (the ranch where you got the horse, not the one you were near a minute ago!) Go to the left side of the top floor and use the old saddle. Trade it for the Gold Pan, and take this item to the gold panning area on your map (it's the star that has no name on the map, to the north of Rock Ridge.) Hop off there, and follow the instructions on-screen. Basically, all you have to do it drop your pan into a twinkly area and pull it back out. Then gently rock it back and forth to get the water, rocks, and mud out until ll you have is the heavy gold. Don't shake it too hard, or you'll empty the pan! Once you've gotten your nugget of gold, take it back to Rock Ridge. Go left until you see an animation of R.J. Earl making a person "look lighter than air" (making him invisible.) Talk to him, and give him the gold nugget you found. He will sell you one of each of his famous elixirs in exchange for it. You can play around with them, but you won't be able to use the Transparency Tonic while you're on the horse. Take them back to Dusty Gulch. Trade the gold pan in for the oil can, and then head back to Diamond Plains. Go all the way right until you reach the clock tower. Climb up to the top of the tower and talk to the guy there. He is building the clock tower by himself because all his workers ran away! Don't worry, we're going to help him now. Enter the clock tower, and drop down to the platform below. Jump over the darker colored platform, then jump up. Remember to avoid the darker colored mini-platforms connected to the sturdy ones. These will fall down after a while of staying on them! Slide off right and to the platform below yours and click on the rope to untie it. It will drop a large metal beam, forming a bridge. Run across and it and jump up right. Hop over the loose platform and drop down right. Keep dropping until you reach the ground. This time you need to jump on the weak plat to drop. Push the crate all the way right and jump on top of it. Climb the ladder. Jump off left and land on the narrow platform hanging there. This can be tough. From there, jump up left, hop over the weak platform, and click the rope to untie it. Another beam will land, near a group of gears. Now jump off left, hop over the loose plat, and jump left onto the beam. Use the oil can here. Now spray oil on the gears by clicking on them. Spray on each of the gears in between the first big one and the second big one (it's fairly obvious which ones are important) until they shine. Then turn the gears. If you do it right they will start spinning. Drop off the platform and to the one where you started. Make sure to slip through under the beam, otherwise you will start walking on it. Exit the clock tower and talk to the builder. The clock is working, and the train is finally pulling into the station! Hop off the clock tower and go right. Keep going, up the hill until you reach the train station. Ride the train, and choose Rock Ridge. Now get ready for the toughest mini-game in Poptropica! In Train Robbery, you must stop a gang of highwaymen (or El Mustachio's Gang) from getting to the front of the train. You do this by firing potatoes at them. Hit one horse once, and it retreats. You have to drive back the entire El Mustachio Gang. Make sure to reload the moment you take care of one horse, and stay at the back of the train car, waiting for the next horse. And remember, you have Concentration Carbonate, which will pause the entire scene in front of you until your next shot. Shoot immediately after you press the SPACEBAR for it, or you will be wasting it. Remember to shoot 1-1.5 in. (2.5-3.75 cm.) in front of the riders to get the shot right. But beware, they shoot back, too! And since you can only take five shots, back up or use Concentration Carbonate when they aim their weapons at you. Once you beat this, you'll arrive in Rock Ridge. Go right and click on the canary, right before you reach the Rock Ridge Train Station ticket booth. This will make you fire your Spud Gun, causing it to drop the key around it's neck. Go over and collect it. Then go right and into the mine. Go right and soon you'll see a cave-in! How are you going to get out of here?! Keep going right and hop onto the mine cart. It will start rolling, taking you along with it! Now you'll enter another easy but very long mini-game. In this ride, which is based on the mine cart ride in Nabooti, you have to use your Spud Gun again to fire at the signs that appear at various points in the track. When you see one, fire at the top half to flip it. This will cause some change in the track that will help you avoid some nasty dead ends! There's plenty of space in between two signs, but they can sneak up on you so don't let your guard down! You can also shoot at the bats, but if you shoot too much then the mine may start to cave in! You can only do this a few times in a track. Once it's over (the track will repeat itself once), you will be bumped off the cart. Climb up the tower, and click on the blue tulip at the top to collect it. Then, the mine will cave in and the screen will fade to darkness... Climb up the rope and click "GO UP" to reach the ground. Hey, was that hole there before? Run right until you reach McGready's Bank, and then jump up to collect the map piece on top of the door frame. This is one half of the map to El Mustachio's Hideout! Oh, no, you're too late! The bank's gone. Then take the train (it's up the ladder; you'll have to climb all the way to the top to reach the train station) to Dos Cactos. This time, the train won't be robbed. Thank goodness! Go left and talk to the guy with the big head. He'll tell you what happened to him. Then use the tulip in your bag and his head will return to normal! He will give you a scrap of ordinary, non valuable paper as a reward. Well, that piece of paper turns out to be the second half to the map for El Mustachio's Hideout! The hideout now appears on your area map. It's in the near bottom left-hand corner, by the canyon edge. Look at those obnoxious signs! Keep going and... Uh, oh... the bandits are outside on lookout! You'll have to use the Transparency Tonic to sneak past them (after getting off the horse), but beware because this only lasts for a limited time! The wick of the candle. The gun over the fireplace. The root beer next to the wheel. When the bandits are scared out, they'll pace around for a while before stopping to shoot you. When this happens, shoot them. If you try to shoot them while they're moving, even while using the concentration carbonate, you will miss! If you must use the carbonate, use it when you're aiming to shoot one of the four items. You can't get El Mustachio yet.